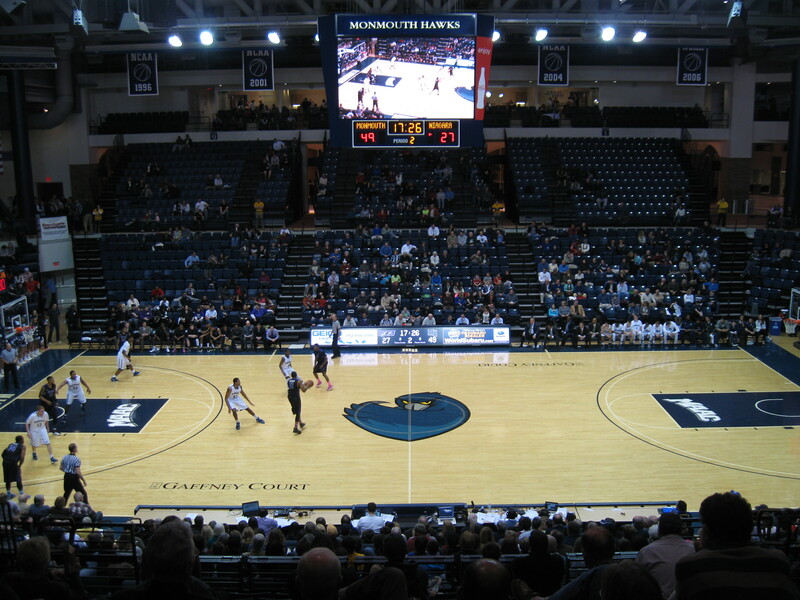 It was not too long ago that I paid Monmouth a visit, as their new basketball arenaopened in 2009 with a weekend series against FIU and then nearby Seton Hall. I went to the Seton Hall game and it was at this contest that a couple rules came to me when making a stadium visit. #1. After a new building opens, I should wait a year or two so that they get the kinks out and fix any necessary tweaks (this proved important on holding off before seeing Citi Field). #2. Don’t see a game against a rival or big-name opponent (which tends to skew atmosphere and fan support). I’ve stuck with this little mini-pack lately and been pleased, but I wanted to get back to Monmouth to see a conference game after they have settled into their comfy confines. A fight through some late Jersey rush-hour traffic got me to the game about seven minutes into the contest as I scurried through the parking lot to the main lobby. They put the box office outside on the side of the building, which is not a good spot and I missed it, having to ask a clearly perturbed woman at will-call where it is (she’s probably been asked a thousand times). The inconvience was made up by the sales guy who gave me a much cheaper student ticket. The arena name couldn’t be more generic (Multipurpose Activity Center or MAC), but the inside is lively and a first-class facility inside the team’s new conference home (MAAC). Though it is a sorta pull-out gym with the stands folding in and out as it sits on an indoor track, once your sitting and watching, the cozy interior is comfortable with great sightlines and aesthetics. One thing I was hoping would improve is the decorative feature of the entrance hallway (Leon Hess Champions Hall). Unfortunately it remains the same as what I saw four years ago, with a distinct lack of displays and the feel of student union as opposed to an arena concourse honoring athletics. My guess of 1500 fans in attendance was reflected in a surprisingly accurate official attendance number (1,475). Not exactly a big crowd and while this is fairly close to their league average this season of 1828, that average attendance ranks third in the MAAC. It was a typical crowd in terms of energy and it was nice to see they produced loud cheers and applause after dunks and big plays. The Hawks were on a nine-game losing streak, but this contest was over before I knew it as I walked in and it was 25-13 in favor of the home side. Monmouth ran Niagara out of the gym and they had a lead of 30 at one point, before completing their last home game with a W. Keep an eye on Andrew Nicholas next season as he looked real good throughout, finishing with 27. Check out the full review of Monmouth’s arena as it has been updated. Next up, a trip to Brooklyn for a Sunday evening NBA game. This will be my second NBA arena (the other was AT&T Center in San Antonio) and am looking forward to the visit. I even saw the Rangers playing an afternoon game, so I’ll be working on trying to get to both as I want to see the renovated MSG.